Alec Lightwood: Magnus, I… I don’t know if you can hear me. This is my fault. I was selfish. When you first lost your powers, and you said you were okay with it, I… I didn’t think twice. I guess I was just so happy that maybe we could… grow old together. I guess I just didn’t realize… deep down, how much you were suffering. 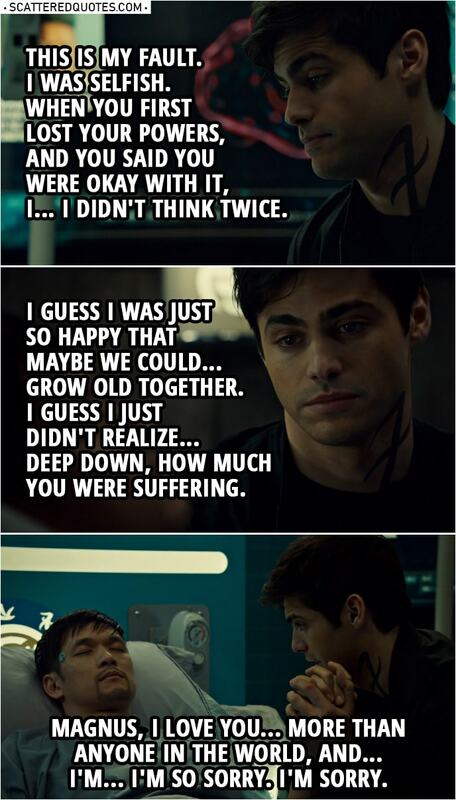 Magnus, I love you… more than anyone in the world, and… I’m… I’m so sorry. I’m sorry.